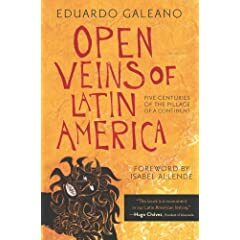 Eduardo Galeano's Latin American History book Open Veins of Latin America: Five Centuries of the Pillage of a Continent has been billed as the leftist history book that Chavez presented Obama on the 'scandalous' occasion when Obama shook Chavez' hand. I especially like when he says: "Richness in the world is a result of other people's poverty. We should begin to shorten the abyss between haves and have-nots."